Nothing helps fix a chocolate craving like a pan of the best brownies! With just a few simple ingredients you are left with a rich dense homemade brownie that is unbelievably delicious! In one of my many emotional breakdowns I discovered my secret stash of chocolate had been ransacked by a sneaky toddler. I wanted to curl up on the couch and pout until more chocolate magically appeared in front of me, but decided a better alternative was to turn to my Cooks Illustrated Cookbook for a great way to help with my sweet tooth. The beauty of this recipe is how simple it is. You can have things mixed up and in the oven in under ten minutes. How handy will that be when you’ve got unexpected visitors, overnight guests, or find yourself in need of a something to take along to that gathering? 1. For a crispy top to your brownies try dividing your eggs. Add the yolks directly to the batter. Whisk the whites until fluffy. Fold in gently before transferring to your baking dish. 2. Use room temperature eggs. 3. Use parchment paper in your pan. This helps with easy clean up and also prevents them from sticking to the pan. 4. Keep a watchful eye on the bars. You want to catch them at just the right time. They might not look completely cooked but that is the secret to a perfectly gooey brownie. This is, hands down, the BEST homemade brownie recipe. It is the one dessert is made on a regular rotation in our home. All of the ingredients are pantry staples making it even easier to try. Even novice bakers will rejoice at the chocolate goodness! It is rich, decadent, and fudgy. All of the signs of a perfectly made brownie! I officially give you permission to eat at least three of these. Like this recipe? You will love my 2 ingredient mug brownies, Guinness Brownies, and Snickerdoodle blondies! Preheat your oven to 350 degrees. Lightly grease a 9×13 pan with cooking spray or line with parchment paper. Set the prepared pan aside for later use. Whisk together the flour, sugar, and salt in a small bowl. Set aside. Combine your cocoa and hot water in a large bowl. Whisk until incorporated. Stir in the unsweetened chocolate until melted and smooth. Add the oil, butter, eggs, yolks and vanilla. Once the batter is smooth fold in the dry ingredients. Gently stir until just combined. Spread your batter into your prepared pan. Smooth out with the back of a spoon. Bake for 30-35 minutes or until a toothpick comes out clean. For extra chocolate goodness try mixing in 1 cup of semi sweet chocolate chips. Oh yum! These look so yummy – now I need some chocolate! These look absolutely amazing! I always love the flaky skin boxed brownies get on top and it looks like yours have that with the delicious chewy, gooeyness in the middle. Yum! Unfortunately, I did not read the comments before making the brownies. I used 2 egg yolks and 2 whites, I did not fluff them or know to do so. Personally I think you should add that into the recipe instead of at the bottom or in the comments. I hope they turn out okay…. If you followed the recipe they should turn out just fine. I’m sorry that you didn’t read the entire post before attempting the recipe. I did adjust to post a bit to reflect the changes in a more prominent area. No, I did not, just read the recipe. You have such a nice way of being condescending. Gena, I just sent you an email with a more detailed apology but wanted to let you know that I am truly sorry that my comment came off as condescending. It was never my intention. I hope the recipe turned out and that future readers will be better informed thanks to the changes I made due to your suggestion. Gena, she was clearly not being condescending… you just didn’t read the whole post. The instructions are very clear, and it never says you MUST whip the eggs. That is just an additional tip. These look delicious! I am always looking for a new recipe to try and what’s better than brownies? Just pinned this one and will try it asap. Thanks for sharing!! Oh my goodness do they look AMAZING!! When do you add sugar? But but but….how can you “add the sugar when you add the eggs and vanilla” in step 3 when step 4 says “combine flour, sugar, et al.????? Can’t say I’ve ever combined sugar and flour in baking so I’ll go with adding it at step 3. Also, if whipping the eggs is what makes this recipe special, maybe that instruction should have been included, not as a sidebar in comments. Recipe could use some editing. I sprinkled sea salt on the top…….Yummy !!!!! What a great idea! I love salty sweet combinations! Easy to make! Added choc chips, hubby and daughter loved these!! Sorry the measurements are a bot different here where you have a T is that teaspoon or tablespoon? I am looking for a fairly cheap brownie version as I have to make a lot but all the ones I have tried that just use cocoa turn out like chocolate cake. Do you have any budget friendly brownie recipies that actually turn out like brownies? I will go into the recipe and change that in the next few days… the “T” is tablespoons and “t” is teaspoon. Oh Yum! These look amazing! Thank you you for sharing your recipe. If you’re using this in a stoneware baking dish should the temp or time be changed at all? Or just keep an eye on it? Looks delicious! 🙂 excited to try it! I would just keep an eye in it. I’ve never had to adjust the temperature before, but I don’t use stoneware often. I have just mixed up these fabulous looking brownies and noticed that they did not have any baking powder in the ingredients list. Do they not need a leavened. I added a teaspoon just in case it was a mistake or an omission . Please respond. Thanks! No typo. I didn’t use baking powder. These turned out to be amazing! After trying out so many recipes for brownies, i think i finally found the one! I am so glad you and your family enjoyed them! Does it have to be dutch cocoa powder? Some of my family have problems with what is in cocoa powder, so we use an all natural one from sprouts. I just happen to be a fan of Dutch, but you can certainly substitute other types of cocoa. Let me know how they turn out! The directions could really use some tweaking. I consider myself pretty good in the baking department but the incomplete instructions messed these up twice. First, we turned down the heat instead of took it off the heat and burned the chocolate. So we had to start over. Then I was putting them in the pan and realized the instructions never say when to put the sugar in so we had to mix in the sugar at the last minute which left the consistency a little grainy. They are still tasty but I think some more complete instructions would make it a lot easier to try to make these again. Sorry you had such a rough time with the directions. I went ahead and adjusted them to keep people from having trouble in the future. Sometimes I get ahead of myself when I write. Thanks for your feedback! I suggest sticking pretty close to the actual recipe. Unsweetened chocolate is a vital part of the mix. Hey.!! I hv a doubt..is it lyk 1/2 cup n 2 teaspoons of water..!!?? Or is it 2 tablespoons? Would be glad if u could help me. I tried this recipe but with black onyx cocoa powder! I’m wondering if it’s the same as what you used because my brownie came out not brown like yours but as black as night. So I’m curious to know which is correct since both would have different effects in the recipe. Hope you could enlighten me! I removed that comment. The recipe version is the correct version. Thanks Jesseca! 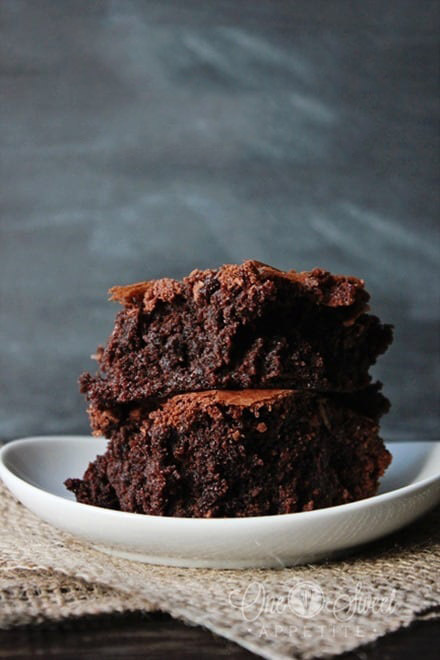 (; this recipe yields really moist and chocolate-y brownies that are to die for!! Made these tonight after our Sunday dinner. Everyone loved them! I used your tip to whip the egg whites and our tops turned out perfect! I will be adding this to my recipe book to make over and over. Hey! I love brownies and I think I might try this out on the weekend. Just to be clear when you 3×9 pan, that’s inches right? You got a new reader from Brazil! 1. What do you mean by the dash symbol ( – ), in the “2 -1/2 cups of sugar” and “1 -3/4 cups of flour”? I’m sorry if this is a stupid question but I’m not American so I’m not familiar with US metrics. 2. You said that we should add eggs into the mixture of cocoa and chocolate in the boiling water. Should we wait until the temperature of the choco mixture quite normal before adding the eggs? I’m afraid the eggs will be cooked when I add them while the mixture still warm. Please help me. Thanks Jess. The dash symbol is basically an “and”. So two and a half cups of sugar. You can wait for the water to cool, but I whisk it enough beforehand that it isn’t warm enough to cook the eggs. Questions about getting the crispy brownie tops. You mentioned whipping the egg whites. Are those egg whites separated from the egg yolks that are in recipe itself? Also, did you whip them to soft or stiff peaks? Thanks!! I just separate the 2 full eggs that are called for in the recipe. So mix in 4 yolks into the recipe and fold in the whites after you have beaten them into stiff peaks. I don’t use a mixer, but I know several readers have and it worked out ok.
Hello! I tried this today and it was mostly succesful haha. I was just wondering, if I used olive oil instead of vegetable oil will it be okay? And using less sugar will work too right? I once made brownies with extra virgin olive oil. I ended up with olivey brownies. -_- So if you must use olive oil, I would use the light stuff. i love the way this recipe sounds, but i really don’t like separating my eggs. will it turn out right if i just use two or three whole eggs? Just made these today and they are soooo yummy!!! I whipped the egg whites and folded into the batter, like you said for a crispy top, but it didn’t come out as crispy as yours look in the picture… Any suggestions?? I’m teaching my daughter to cook a bunch of different things and this week’s edition is your brownies. I’m VERY pleased with the outcome! My only suggestion, if your household is like mine, is to cut back on the sugar. The batter is VERY sweet based on the fact that we do not do “added” sugar and have cut back quite a bit on products with sugar. So to us, it’s a bit much. That’s not a criticism, just a bit of advice for the “lesser” sugar households. They just came out of the oven so we haven’t cut into them yet, but they look fabulous! Thanks for the recipe! I love the idea of trying these with a lesser amount of sugar. It’s always a good idea to try to cut back. Best brownies ever! I used dark chocolate chunks which gave it a really rich flavor. Made these twice this week and they’re sinful. Thank you. looks delicious! if we only have semi-sweet chocolate would suggest backing off on the sugar a bit? and if so how much? Unfortunately we haven’t had success with semi sweet. Let me know if you figure out the proper ratio! about the egg white for crispy top, do i have to incorporate it in the batter before spreading in the pan or i would just spread it on top of the batter in the pan? Thanks. This recipe looks very yummy and i would like to try this since i’m new 2 baking. Fold it into the batter before you spread it into the pan. Good luck! I just used your recipe to t ach a 16 year old boy how to make brownies. And english is his second language, and they have a different measurement system here. They still turned out super! I made these brownies yesterday to take to family dinner tonight! Can I just say that these are the most delicious brownies I have ever made. I’ve made from scratch brownies before that couldn’t even hold candle to these. My husband and I were eating them right from the pan. My 3 year old daughter has been enjoying them as well. I can’t wait to share them with the rest of my family this evening. I am an avid Baker and always arrive with something sweet, but these brownies are going to blow their minds! Thank you for this recipe! Jessica, haters gonna hate. I can’t wait to make these brownies. Thanks! These are delicious, just enough sweetness, chocolate and texture. I didn’t see a problem with the recipe at all. Everyone in the house lived them. Hopefully there will be enough for a brownie, strawberry, whip cream trifle for Easter tomorrow! Thank you very much Jessica, my granddaughter and I will make them again. Easy and delicious. Fantastic recipe! Thank you for posting! I’m so glad I stumbled this. :). I’ve experimented with a lot of brownie recipes and love how you mixed pieces of the different approaches (ie oil and butter, cocoa and chocolate). Ps. Isn’t it ridiculous the lengths you must go to keep all of these petty and rude people happy? MY God Jess, you have the patience of a saint. My thanks for the recipe as well, tried it last night and they are L U S H !!! 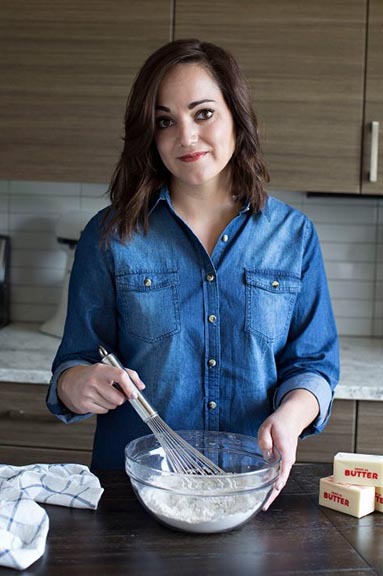 Jessica, I absolutely adore this brownie recipe. I will now use NONE other, and this is always my go-to for dessert for friends and family. Thanks for the great recipe! I just made these brownies this afternoon – delicious!! Luckily I read through the entire post and through some of the comments to find the best way to bake them. I ended up adding a caramel glaze and some sea salt as a topping and it added to the ooey-gooey goodness of the chocolatey brownie. I can honestly say this will be my go to recipe for brownies, forever! These brownies were amazing ! Super moist and easy to make !! If i do not have dutch cocoa, can i substitute with normal cocoa? Yes. Dutch cocoa is a bit richer so the flavor will be different but I’ve had readers tell me they were still good. They are on the sweeter side for a brownie. Yay! I’m so glad you like the recipe! This was the only recipe that I found online that matched the pan size and the ingredients in my pantry. After reading all the comments I wasn’t sure if I should make it but I gave it a try. I followed the recipe step by step, didn’t change anything. It turned out great! First brownie I baked in my life. Directions are easy to understand and English is not even my first language. Don’t let negative comments discourage you, just go and bake it. Yay! I’m so glad you liked them! You mention using a 9×13 pan. When I see pan I think metal or aluminum. Would using glass change the cook time or temp? I was thinking of just getting those cheapo disposable pans but I’m afraid the brownies will have a burnt bottom. I’d just place the disposable containers on a baking tray. Keep a close eye on them but they should be just fine. Hi Jesseca, I have a question, I live a Mile High, do you have any high altitude instructions, like adding an extra tbls or two of flour to the dry ingredients? Also I have a tip for putting parchment paper to the pan. If you very lightly spray the pan then smooth the parchment paper in the pan, I also cut the corner and put a bit of oil on my finger and smooth one corner to the pan and the other point to the other side of the paper. It eliminates the wrinkly mess you get otherwise. Thank you for the wonderful recipe! I’m making them for my Husband’s Valentines. I’m at a pretty high altitude as well and don’t normally have to add an additional flour but I know that a few people have added a tablespoon for safe measure. Let me know how they turn out and I LOVE the tip about the parchment. I’ll give it a try this weekend! “Add the yolks directly to the batter but whisk the yolks until fluffy” – You mean add the whites directly and whisk the yolks? Or maybe it’s late, and I’m just not understanding what this means. Appreciate the clarification in advance! Thanks for catching that typo. Whisk the egg whites until fluffy and fold them in. I’ve fixed it in the post. What does it mean to fold them in?